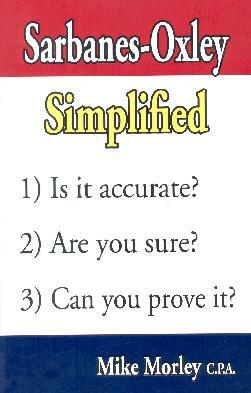 My book "Sarbanes-Oxley Simplified" is now available in bookstores, and through Amazon. Ignorance is no longer an excuse! The Sarbanes-Oxley Act makes CEO's and CFO's personally responsible not only for the accuracy of their financial statements, but also for reporting on the effectiveness of the company's internal controls. Complying with the requirements of the Act can seem overwhelming, but this one slim volume will walk you through the implementation process quickly and easily. To buy this book on Amazon.com click below. To buy this book on Amazon UK click below. To buy this book on Kindle click below.